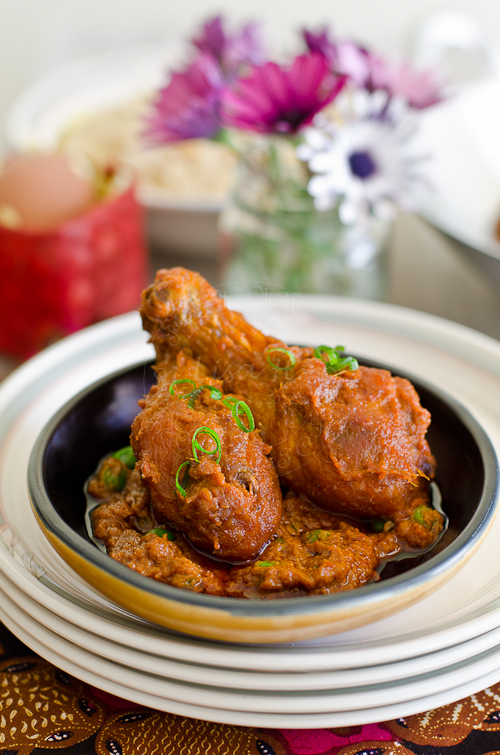 I guess the best way to describe Ayam Masak Merah would be ~ Fried Chicken cooked in rich-creamy Spicy-Tomato sauce. Mentioned Ayam Masak Merah to a Kedahan (Kedah is a state in the far North of Malaysia), would immediately evoke memories of ‘Traditional Malay Weddings’ and perhaps Hari Raya / Eid Celebration. Yes… Ayam Masak Merah is not an everyday affair in a typical household in Kedah. It is a unique dish to be enjoyed on special occasions… served with Nasi Minyak / Savoury Rice, fresh salad of cucumber, pineapple, cut-up chillies and red onions. The chicken pieces are rubbed in with turmeric and salt and are deep fried till golden in colour. Deep frying seals the juice as well as it gives the chicken pieces, a firmer texture to every bite. The pieces are then added to the simmering sauce. This gives the chicken, its rich flavour, with its subtle heat from the chillies, sweet and sour-ish taste from the tomato soup combine with creaminess from coconut milk. Moslems in Malaysia and around the world will be celebrating Hari Raya Aidil Fitri,/ Eid Mubarak soon, perhaps Ayam Masak Merah could be one of the dish that you might want to cook and join in the Celebration. 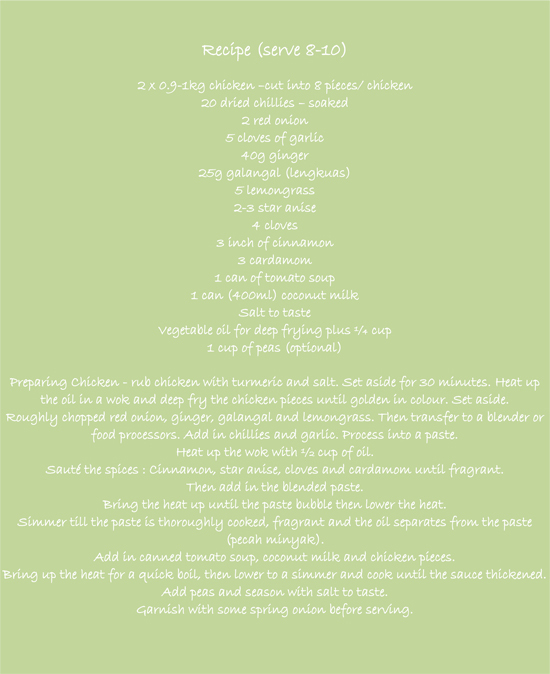 The recipe for Ayam Masak Merah courtesy from my sister... who happened to be a great cook. I am submitting this to Suresh Chong of 3 Hungry Tummies for the Muhibbah Malaysia Monday..
Lisa, delicious ayam masak merah, so inviting. I'll be having this for lunch too. Lisa, thanks for your guest post. It's seriously the best looking chicken dish EVER. I drool thinking of the kenduri and I had missed since moving to the US, sigh. Selamat Hari Raya and now my eyes are set on your kuih semperit. OMG. Lisa, Yum! One of my fave Malay dishes! That dish looks amazing! Heading there. Ni memang favourite I.. boleh makan semua tanpa masalah! I know I may not pronounce the dish correctly, but I’m sure it is a dish I’d enjoy. You dish looks inviting indeed. hoping over to rasa malaysia now. Selamat Hari Raya to you, lisa! Oh my favourite dish.. Thanks for sharing the recipe and your beautiful photos. I dont like to deep fry because I absolutely hate cleaning up. Can I add the chicken into the curry paste? your photos are always sooo amazing :) The dish looks so colorful and rich! Your ayam masak merah looks really spicy and good! Have not had this dish in a while. This dish is one of my favorite Malay lauk ayam. Kalau orang masak time Raya lagi best. She really is a great cook! Selamat Hari Raya to you and family Lisa, this is my all time favorite chicken dish, the ayam masak merah:D Always buy this from the makcik near my workplace whenever I have a craving for it. Hi Lisa! Beautiful guest post and I always love your food photography. It always make me want to grab it from the screen - people say that often, but your photography is so beautiful that it's hard to see if it's real or not (sounds exaggerating? but what can I say, it's true!). I've never tried this dish, but your delicious chicken is already in back of my memory and will try it when I get a chance! Salivating! Salivating! Eid Mubarak. Great post. Thanks for sharing. Craving for the chicken, Love the photo. Your ayam masak mesh recipe rocks! Love the photos, so appetizing. I am Having a major craving now. I hope you had a lovely Eid! How could you not with this sumptuous looking chicken dish! I'm positively drooling! Thanks Winston... I just want them to 'connect' with their roots through food :D.
I can't believe I have not eaten Ayam Masak Merah.. Shame on me!! Yours made me drool! Lisa, I had a cute triple award waiting for you at my blog. Lisa, I just KNOW it's as delicious as it is BEAUTIFUL. Hi. Is the tomato soup the same as tomato paste? Puree?